For many Wii owners, a long drought of quality games has plagued their leisure time as their shiny new white console gathers dust on a shelf. That drought has ended since Nintendo has shipped out “Super Paper Mario,” the latest installment in the Mario franchise which harkens back to the side-scroll/two-dimensional glory days of the NES. Unlike the previous installments of Paper Mario, the latest rendition somewhat withdraws from the turn-based RPG engine and now makes use of the classic platforming action that made Mario what it was over 20 years ago. While the turn-based system has been removed, several classic RPG features remain such as experience points, health points, and side quests. 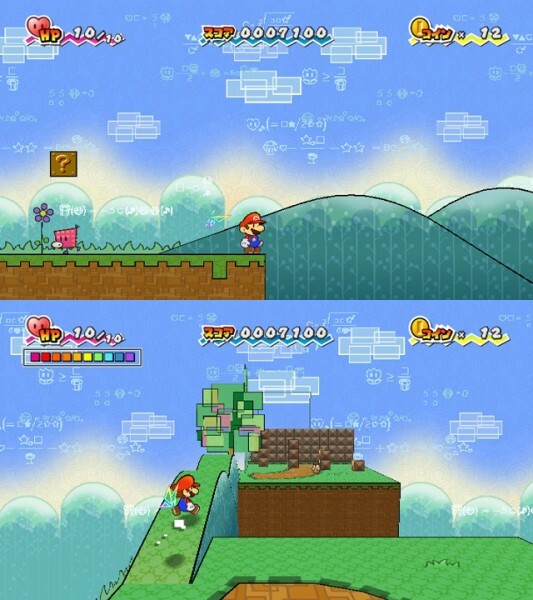 To further improve upon their game, Nintendo has not only made it a classic side scroller, but also gives Mario the new ability to shift the fabrics of dimension allowing him to see in the third dimension. While this is incredibly innovative and does lead to many thought provoking puzzles and hidden items, it does have one large drawback. The primary reason it fails to please is that while stomping enemies in the 2nd dimension is quite intuitive and almost instinctive, in the 3rd dimension, trying to crush monsters as thin as paper when one is also as thin is paper can become quite frustrating. Despite this, the overall game play is quite enjoyable. Further interesting interactions lie in the ability to switch between Princess Peach, Bowser (he’s not the villain! ), and Luigi as each of them has different skills. Along with their unique skills and physical attributes, each character can use a Pixl, a sort of tool which allows the player to perform feats such as bombing, hammering, or even shrinking. Arguably the game’s presentation is what gives it an edge over other platformers and any other game that has come out so far in the spring quarter. 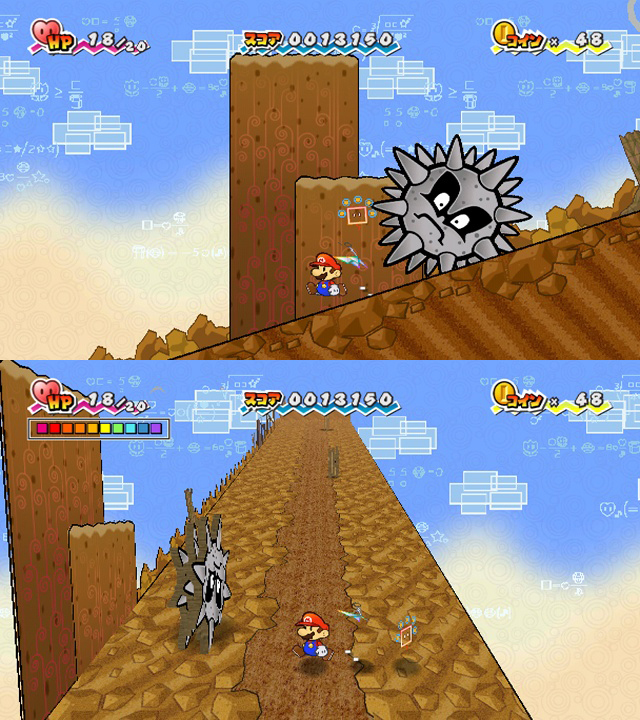 People who have played previous editions of Paper Mario should be quite familiar with the theme that everything is made out of paper (surprisingly fire techniques are not a one shot kill). This leads to many humorous moments which are even further improved up by the comedic lines that appear in the story. For example, various references to “the player” appear when wiimote usage instructions are shown and the selected character acts confused when hearing of this “player.” The actual use of the wiimote itself is fairly simple, it is held sideways similar to the original Nintendo controller giving the player roughly the same number of buttons as well. The motion sensing of the wiimote is only used when searching for hidden doors, performing certain special moves, or for challenge sequences when certain items have been activated. Overall, this Wii game is a good purchase and is well worth owning. Renting this game is not recommended as it’s fairly long and it is best played in short bursts. The story and game play both are well created as the developers of this game took clichÃ© elements of an RPG and a platformer and spiced them together with unique writing creating a mentally engaging experience. For any person who has never given the Mario series a shot before, this is an excellent place to start. Super Paper Mario for the Wii is available online and in stores now for $45. yo should i buy da paper mario or da wario ware? cuz i think mario onlys got 1 playrs and the others got multi. hey, they are actually both 1 player only. paper mario has more value i see as it has an actual storyline and isnt just minigames. warioware is good too, but i would say its the same as alot of other wii games that just use motion sensing, although i heard the motion sensing aspect of it was very good. if you want multiplayer wait for mario party or get monkey ball. good article and pictures I love mario thanks..